The next launch event for the next iPad/iPad Mini is rapidly approaching and it look like the first parts are just starting to leak. 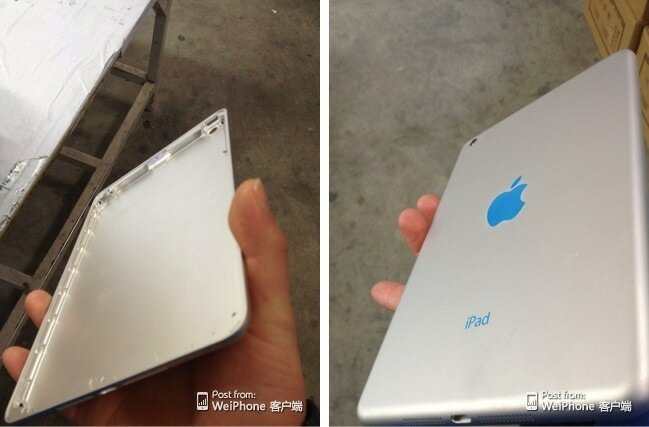 Someone in China has gotten their hands on what looks to be the shell for the next iPad Mini and they've been posting photos on a forum. A member of the WeiPhone forum posted a total of 9 photos showing the shell, including a number of closeups that confirm the blue Apple logo and that the word iPad near the bottom is also blue. It's not clear yet that this is a new iPad Mini shell and not the current one, but it does seem to have about the right dimensions. At the very least we can say that it's probably not a larger iPad or the rumored 4.5", 5", or larger iPhone. All the cutouts seem to match the current iPad Mini, though the curve on the edges looks to be more rounded than before. And this might be trick of the photography but the cutout for the camera looks closer to the edge than on the current iPad Mini.